Before I start, I want to say that I named this blog Sew Old School for a reason. 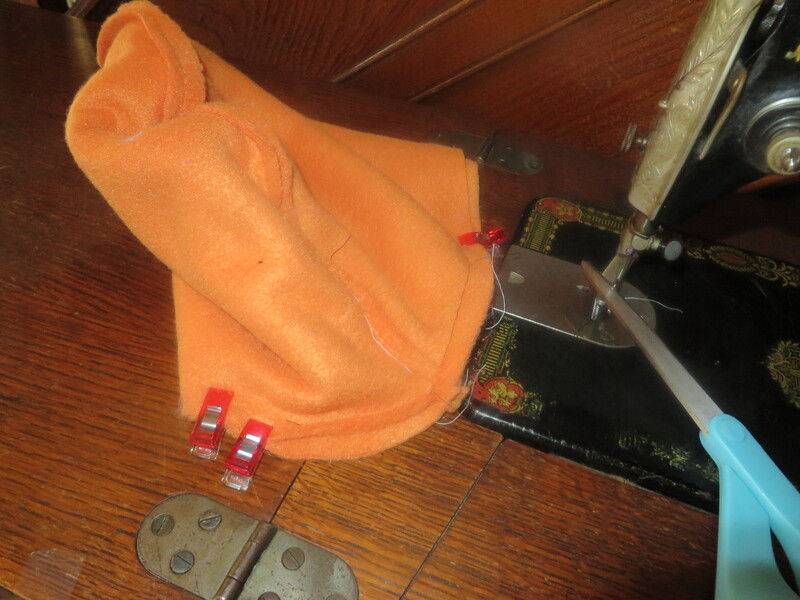 I consider what I do to be sewing old school — from the machine I use, to the absence of purchased patterns, and to the fact that I sew from a picture in my head and show everyone on here my test runs. My projects are far from perfect; they are often my first attempts. 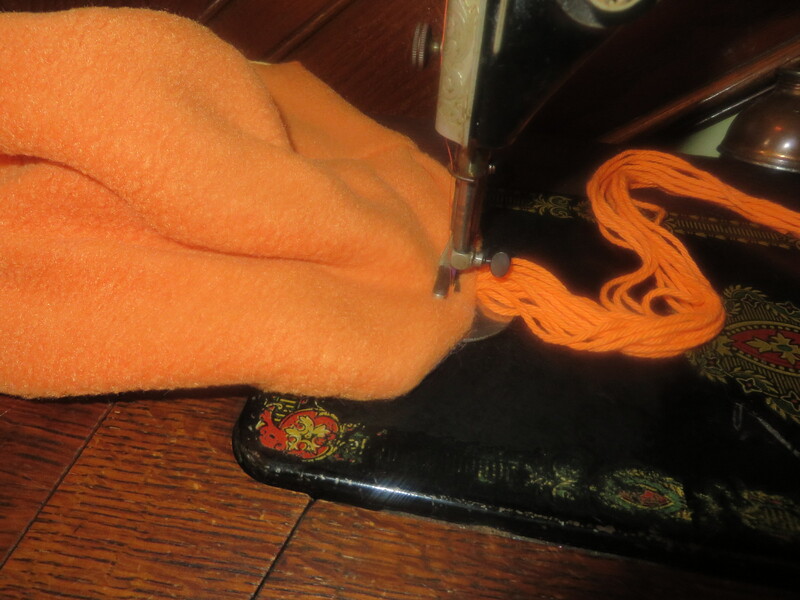 My goal is to get my followers sewing old school like I am! When you sew old school, you challenge yourself to create true art, something one-of-a-kind every time w/ what you have on hand! 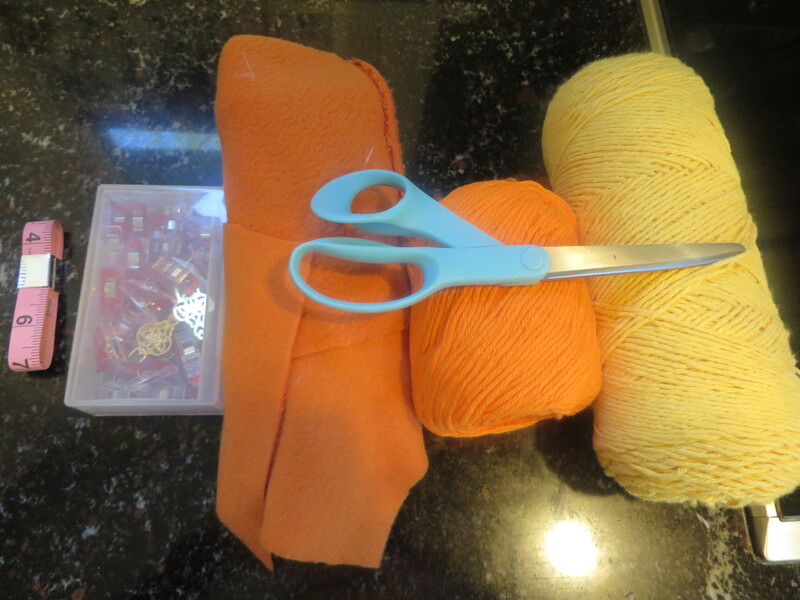 Two pieces red-orange fleece (to size of your child’s head*), matching yarn, yellow yarn, Wonder Clips, measuring tape, scissors. 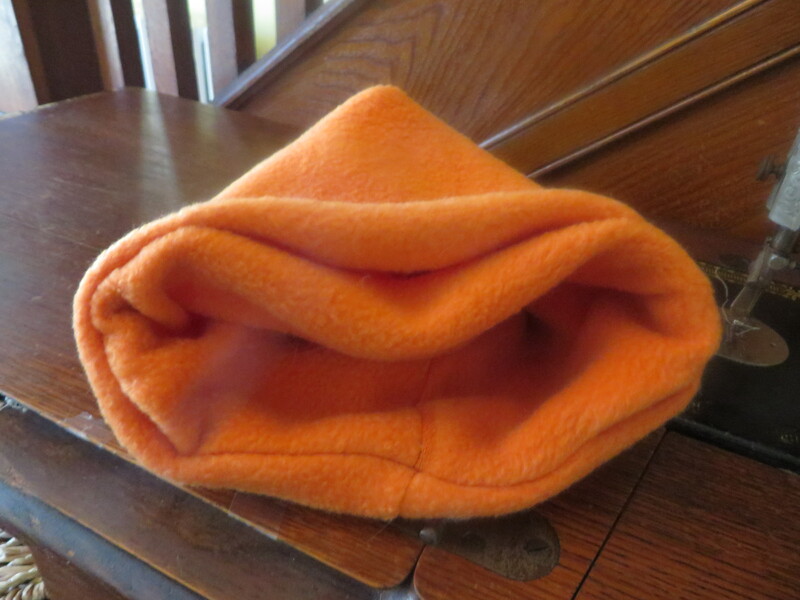 First, you will need two pieces of fleece cut to the size of your child’s head. To get your measurements, use a measuring tape to measure around child’s head. Jot down that number. Now measure from one ear, over the head, to the other ear. Take this number and divide it by two. Jot that down, too. 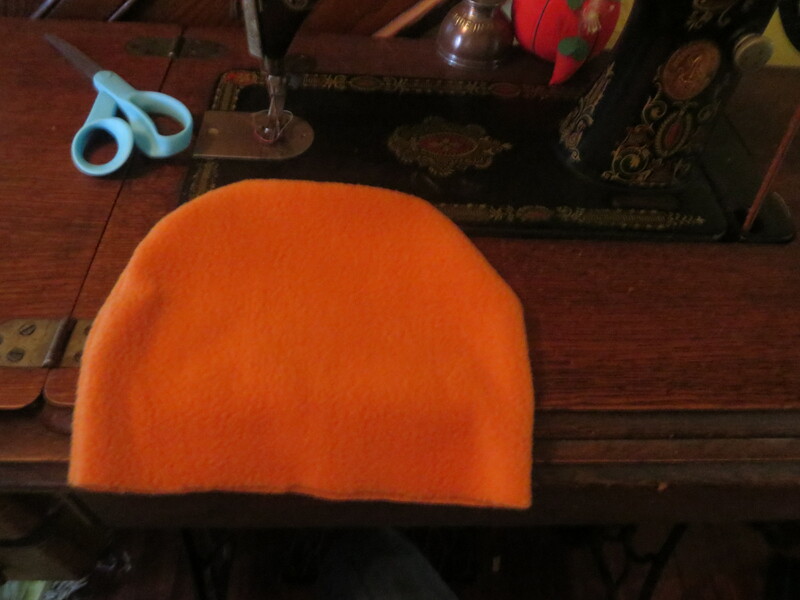 Rectangle cut for body of hat. *You will cut two of these. Now you want to lay these on top of each other, pretty sides together, and fold in half. From here, you want to cut the shape of a hat. Hat body piece cut from one of the rectangles. Hat body piece sewn and turned right-side out. Do the same for the other rectangle piece. One hat inside the other. *Make sure pretty sides facing each other! 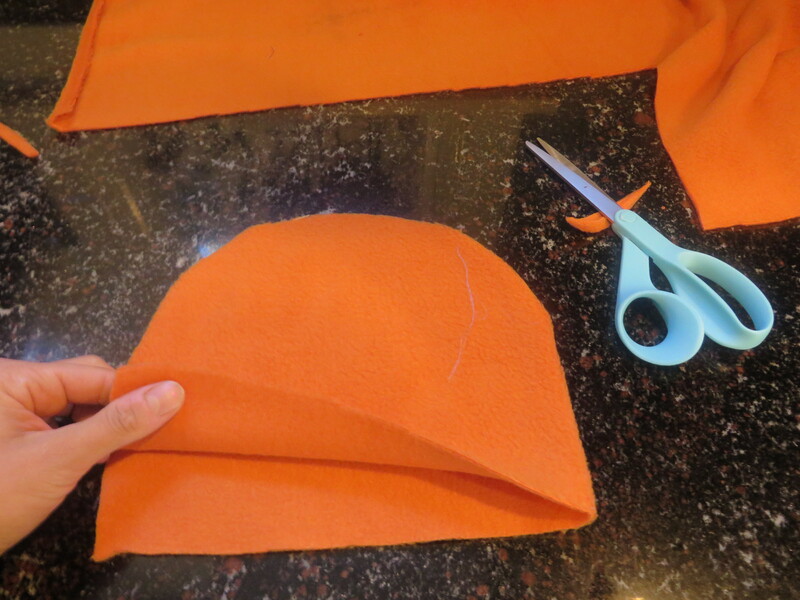 To line up very cleanly, use your seam (seen in picture above at bottom of hat) to line up both hats. Now you need to decide where you want your bangs and braids to go. 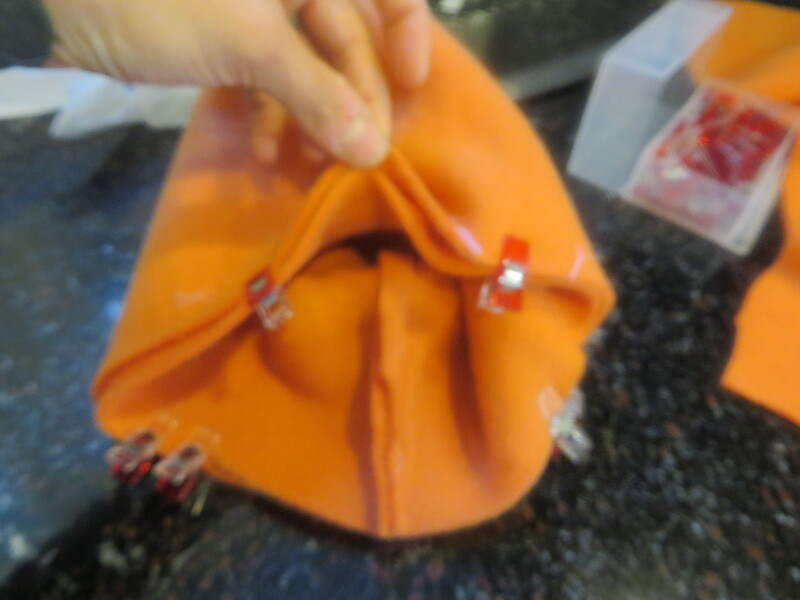 To do this, you can actually put the hat on a mannequin, or the person you are making it for, and actually place Wonder Clips (I love these things!) or pins to mark the areas. 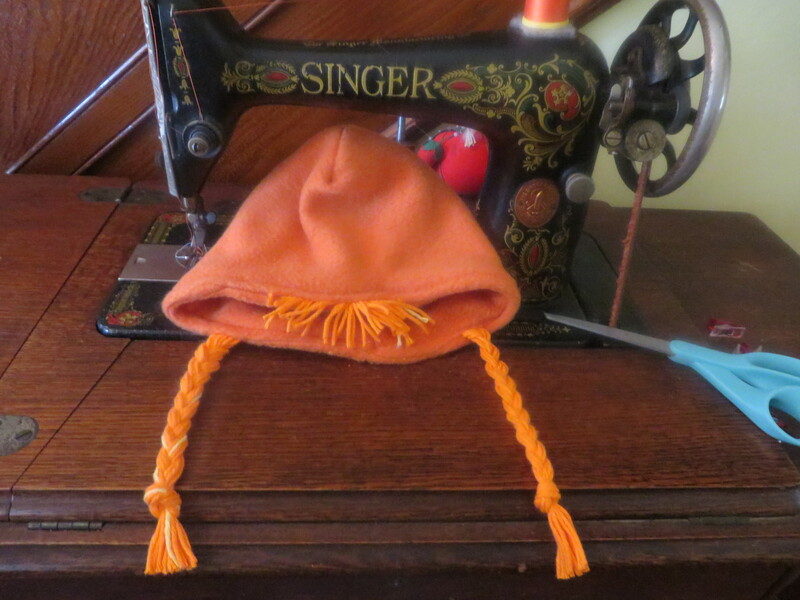 Next you need to sew your hats together, making absolute sure to leave openings where you have pinned for your bangs and braids! Pinned to mark openings for bangs and braids. 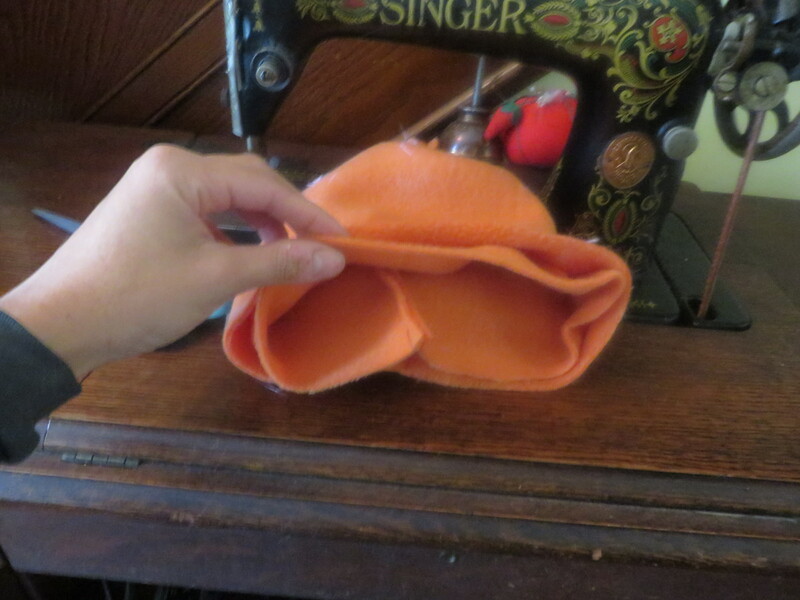 Sewing two hat body pieces together, skipping over pinned areas for braids and bangs. 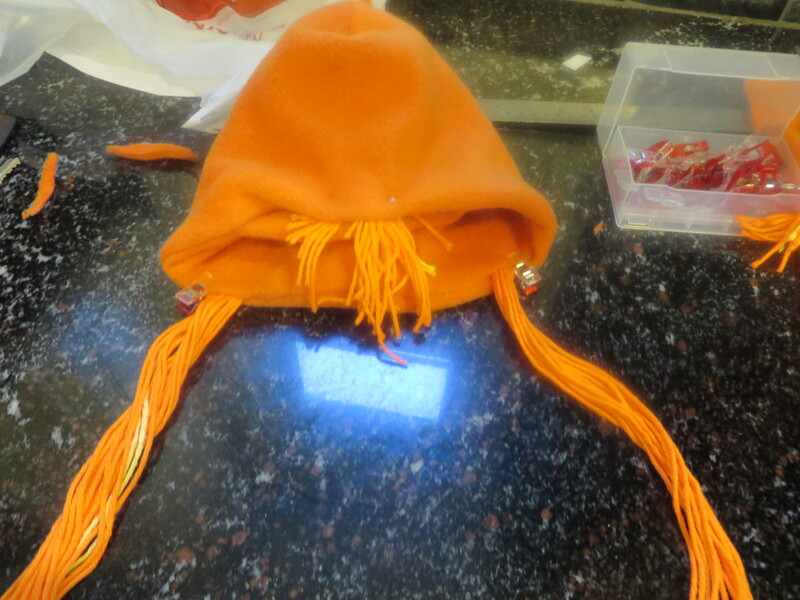 Once that’s done, you can use the turning hole you’ve left at the bangs area to turn your hat right-side out. Looks kind of funny and possibly like you messed it up, but I’m sure you didn’t! 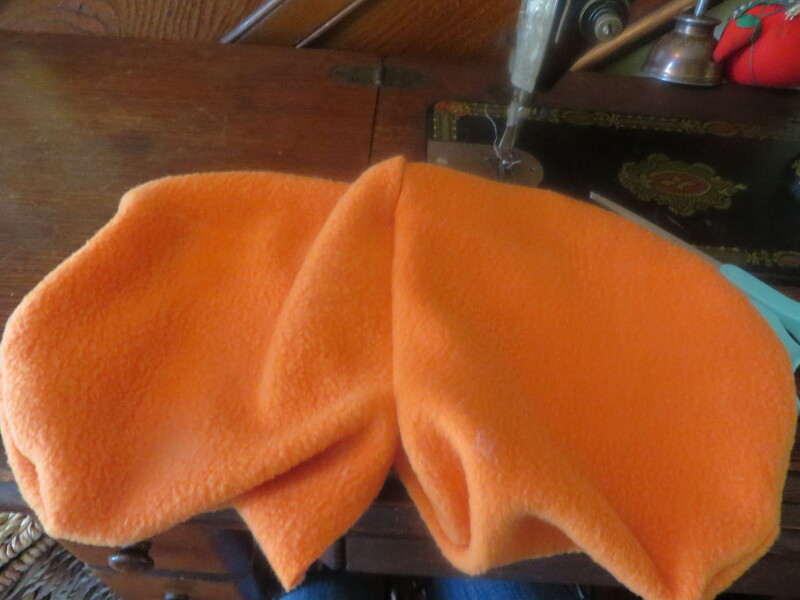 Turning hats right-side out after they have been sewn together. Hats turned right-side out and with one inside the other. 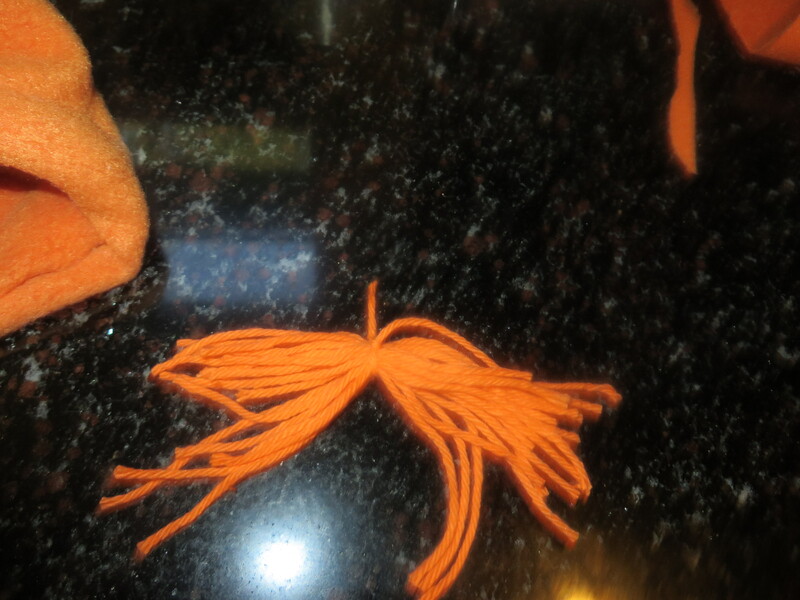 And now you can get cutting your braid and bang lengths from your orange yarn. I cut mine and tied them together so that I could fit them in the turning holes and sew it all at one time. Let’s break all that down w/ pictures so it’s as super-duper clear as this project is quick and easy. Threads cut and tied for bangs. Darn, I forgot to get a picture of the braids. Basically, just cut a desired length and thickness of braids and knot at the top. Don’t go to thick, because the knot will reside inside your hat and could be uncomfortable if too big. Now it’s time to insert our hair in our openings, pin, and sew! Now it’s time to pin and sew! When I sew over the braids, I like to go over the section holding the braid in three or four times for added security. 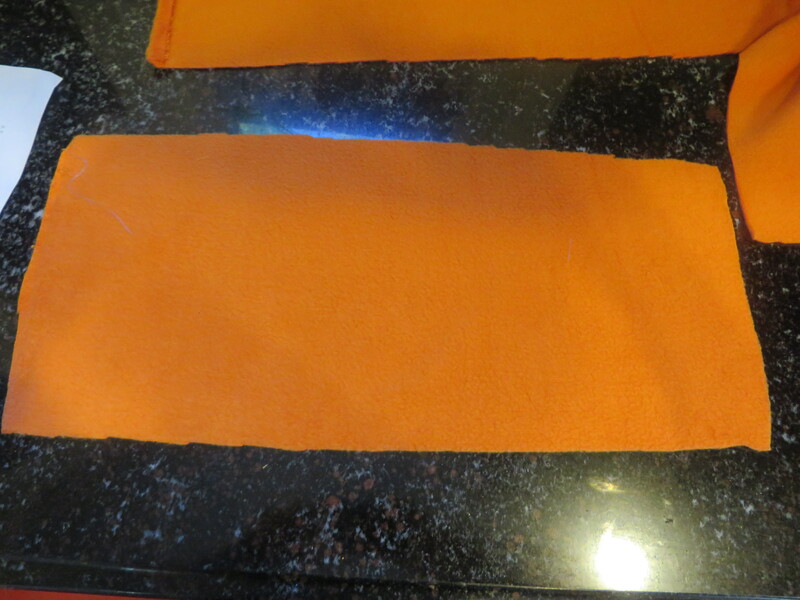 Sew over this section three or four times as kids have a tendency to yank on the braid pieces. Braid the braids and knot, and trim the bangs to desired length! Totally optional, but I threw in a couple strands of yellow thread to signify the highlight that Anna has in the movie. Thought it was a cute little detail. Have fun w/ this one! And stay tuned for future tutorials for Anna’s cape, dress, and an alternate hat w/ attached bonnet. Here’s a sneak peak at the finished product w/ the bonnet, because it was so fun to draft up the pattern and because I stink at keeping surprises, surprises! 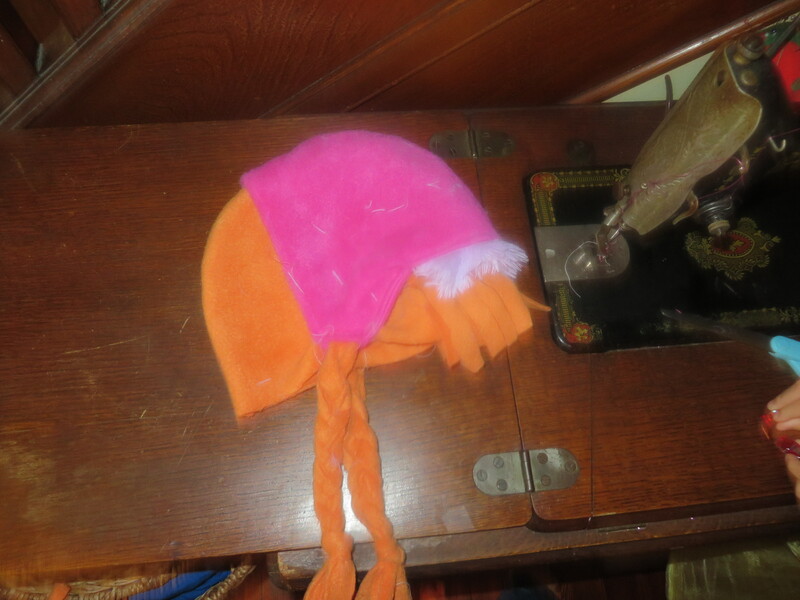 Anna hat w/ attached bonnet preview pic! Tutorial coming soon. < Previous Ballet Slippers Tutorial – No Pattern Needed and FREE!